The Bavarian market village of Murnau sits astride the main railway line from Munich to Garmisch. Urged on by Kandinsky, Münter had bought a house there in August 1909. Situated on the Kotmüllerallee a short distance from the centre of the village, it soon became known as the "house of the Russians" because many of Kandinsky's compatriots congregated there during the years immediately before the First World War. Among them were fellow-painters Aleksej von Jawlensky and Marianne von Werefkin, the sculptor Moissej Kogan the dancer Aleksandr Sakharov. Kandinsky himself returned to Russia following the outbreak of war in summer 1914, effectively ending his relationship with Münter. They met for the last time in Stockholm in the winter of 1915-1916. 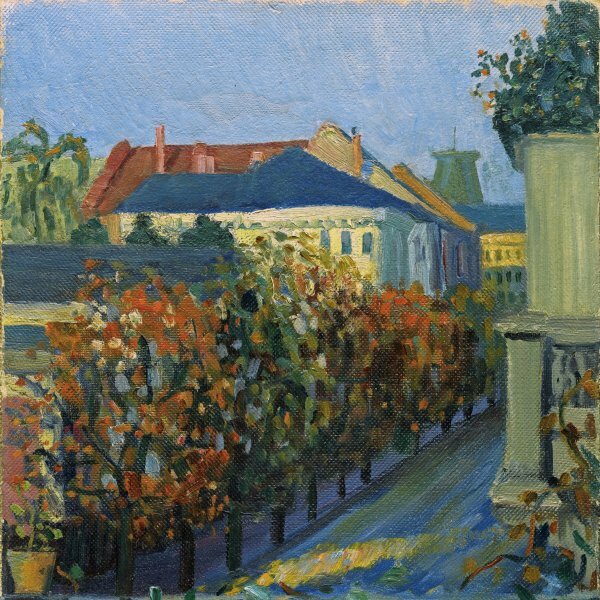 After his marriage to Nina Andreevskaya in 1917, Münter prolonged her stay in Scandinavia until the war was over, returning to Germany only in 1920. However, she kept on the house in Murnau and during the early 'twenties usually spent part of each summer there. The house and its surroundings provided the subject matter for many of her paintings of this period, including the present picture, which Münter inventarised as "L (meaning "landscape", in German "Landschaft") 97." 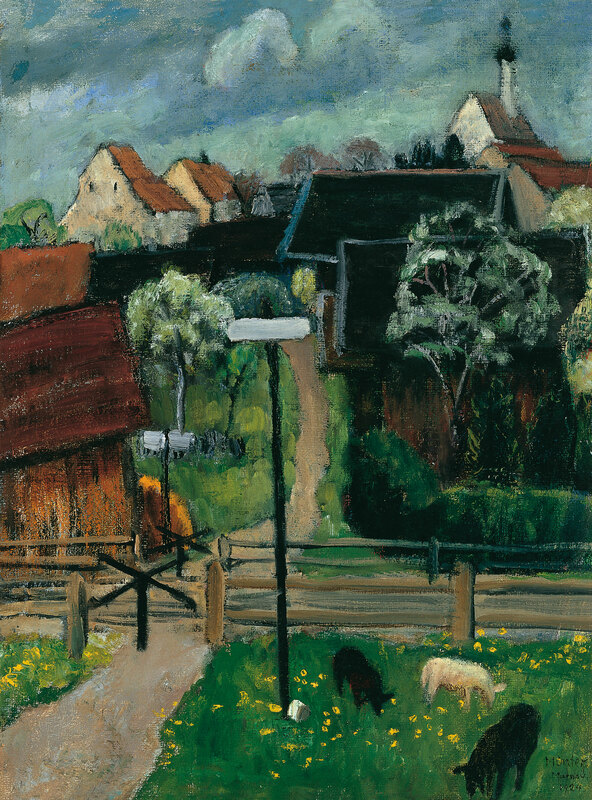 It is probably identical with a work she entitled "Studie 3: Bahnübergang, " corresponding to a diary entry dated 12 May 1924, in which the artist recorded that she had painted a canvas depicting "level crossing with sheep (Bahnübergang mit Schafen - Leinwand)." According to her "Notizkalender" for 1924, she spent almost the whole of May that year in Murnau. During that time she painted several other views of the village, among them a view of the main street decked out for the Whit Sunday procession. Murnau in May is painted from a standpoint close to the bottom of Münter's garden. The railway line is clearly visible in the foreground of the painting, bisected by a now-vanished path leading towards the centre of the village. The parish church of St. Nikolaus and its cluster of adjacent buildings can be seen in the distance. Surprisingly, Münter's depiction of the church omits one of its most striking features, its ornate Baroque façade with gable and oculus which, as far as it is possible to ascertain, must have looked very much the same in 1924 as it does today.